Mining Forman - Matriculation & Diploma in Mining with valid Mines Foreman Certificate of Competency from DGMS under MMR (for metalliferous mines) with 1 year post qualification experience in the relevant field. Mining Mate - Matriculation with valid Mining Mate Certificate of Competency from DGMS under MMR (for metalliferous mines) with 1 year post qualification experience in the relevant field. 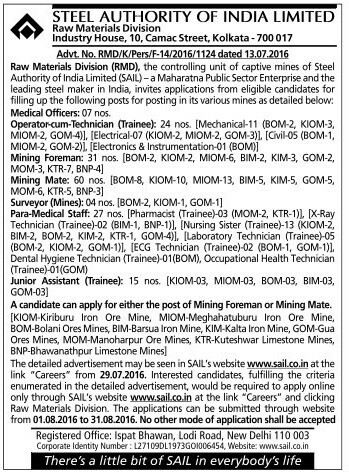 Surveyor (Mines) - Matriculation with 3 years full time Diploma in Mining and Mine’s survey from a Govt. recognized institute with Surveyor’s certificate of competency and post qualification experience of at least 1 year in the relevant field. Junior Assistant (Trainee) - Graduation with one year diploma in computer application. Minimum 50% aggregate marks in Graduation (40% aggregate marks for SC/ST/PWD candidates). Typing speed: atleast 40 w.p.m. [36 w.p.m. for SC / ST / PWD / OBC(NCL) candidates]. Short hand speed: atleast 80 w.p.m. [72 w.p.m. for SC / ST / PWD / OBC(NCL) candidates].